Bihar Public Service Commission organised the Child Development Project Officer recruitment examination on 15th July. On 26th July (today), the commission has revealed the answers to all the questions. 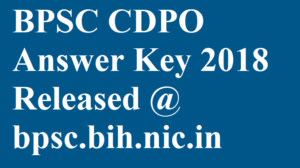 Candidates can now check out the BPSC CDPO answer key 2018 series wise (whether A, B, C, D). The answer key has been issued on the authoritative web portal – www.bpsc.bih.nic.in. The administration has directed that the released answer key is completely provision. If a candidate finds any discrepancy in the solutions, challenges can easily be filed. On the basis of objections, the experts will prepare another answer key that will be considered as final. Using that answer key, the OMR answer sheets will be analysed. To assist aspirants, the board will accept forms for the objection which must be sent (with roll number, name and address) to the address of the Bihar Public Service Commission. Aspirants need to make the speed post in such a way that, it will be accepted by the authorities before 5 PM on 10th August. Form accepted after the deadline will not be entertained. Aspirants must write the exam name and notification number on the envelope. Points to be filled in the form are Question number, answer prepared by the commission, the aspirant’s solved answer and the proof. 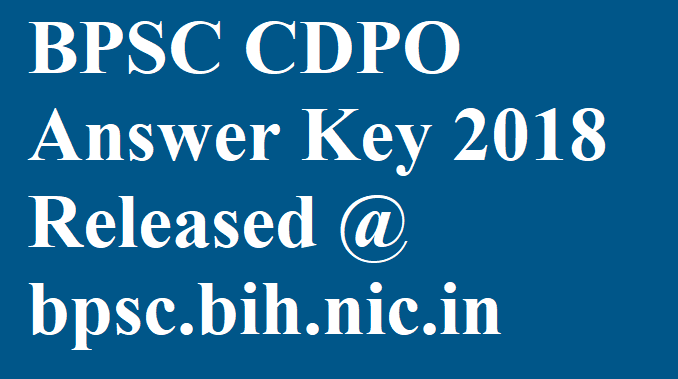 www.bpsc.bih.nic.in is the online platform answer keys are available on. After being on the home page, candidates will get the link for the key easily for Booklet Series A, B, C, D.
A notice for how the objections can be raised will also be given. There are a total of 30 vacancies of Child Development Project Officer for which, the applications were accepted from 3rd to 12th July. Written examination for the same recruitment was strategised on 15th April at a total of 112 exam centres. Result date: The commission has not provided any notice defining when the result will be declared for the vacant posts yet. The notification for the recruitment was issued by the commission in September 2017 and almost 10 months later, the authorities announced the exam date and further proceedings.